The Scottish Government and Greens were last night edging closer to striking a deal to get the budget through Holyrood – on the basis that local councils get more support. Finance Secretary Derek Mackay has been under growing pressure after the Scottish Greens said they would vote against the budget unless more money was given to councils. The Conservatives and Lib Dems have dismissed a deal unless ministers rule out a new vote on independence. Last night, Highlands and Islands Green MSP John Finnie reiterated the calls for more money for councils and warned that otherwise the most disadvantaged in rural areas would suffer from service cuts. 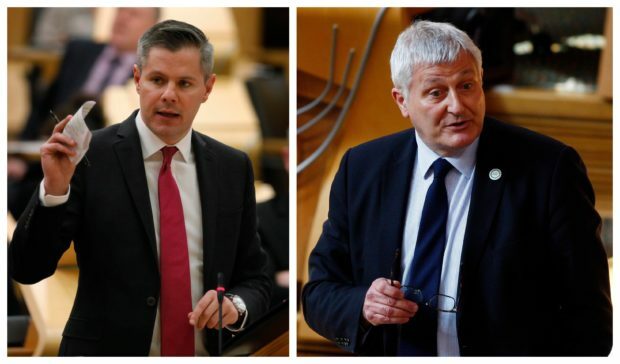 With his party holding the whip hand in budget negotiations, Mr Finnie also said Mr Mackay should look at raising income tax to raise more money for local authorities and said reform of local government taxation would enable councils like Moray to mitigate cuts. Mr Mackay is unlikely to meet any demand to raise income tax further, but Scottish Government sources were last night “hopeful” that a deal could be done with the Greens to secure enough support to get the £33billion package through parliament. Last night’s signs were Mr Mackay could secure Green support if he came up with an additional £237million for councils plus legislation to scrap the council tax by the end of this parliament. Powers for councils to levy a tourist tax were also “on the table” as talks between the Greens and the SNP continued last night. The SNP-run Moray Council has proposed shutting swimming pools, libraries and public toilets in order to save money. Mr Finnie said such an approach would limit opportunities for the disadvantaged. “There will be no rural community that will be untouched if we can’t maintain good quality local services,” he said. Mr Finnie added that his party “wouldn’t be shy” about seeking more progressive income tax. Aberdeenshire West Tory Alexander Burnett warned a SNP/Green deal risked further tax hikes, pointing out that would affect the north-east where the success of the oil industry means many workers are higher earners. “People in the north-east have already been hit disproportionately by the SNP’s high tax agenda,” Mr Burnett said. Mr Burnett said there was anger about the high business rates paid in the north-east and called for Scotland to be brought into line with the rest of the UK and have a revaluation in 2021, rather than 2022. Like the Tories, Labour has ruled out supporting the budget. Labour North East MSP Lewis Macdonald said there was “no provision” for major rail projects in the north-east and called for more funding for local government and NHS Grampian. Orkney Lib Dem MSP Liam McArthur said more cash should be spent on mental health, education and local government. Gillian Martin, SNP MSP for Aberdeenshire East, claimed blocking the budget would stop a £730million increase in funding for health and care services, including £37million extra for NHS Grampian.